Home / blogging ve youtube / Blogging vs YouTube: Which is Best Online Earning Career in 2019? / earn blogging / earning source / News / which is best earning platform / Blogging vs YouTube: Which is Best Online Earning Career in 2019? Hi friends! 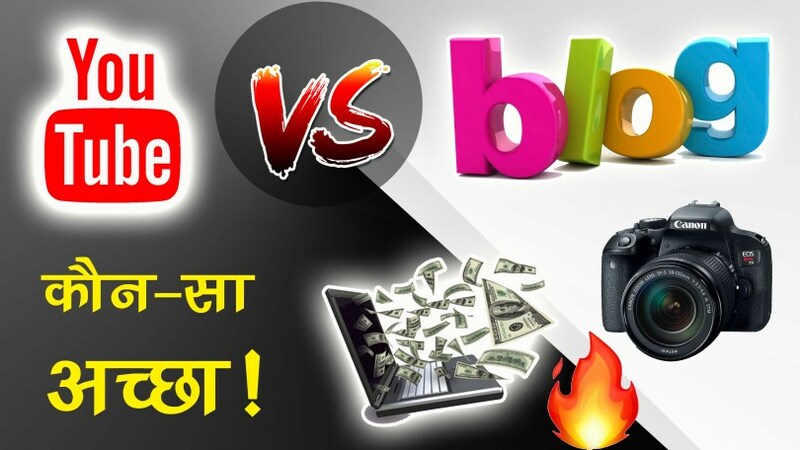 This is a detailed information about blogging vs YouTube. If you are earning or wanting online, you must have heard about blogging and YouTube. So today I'm going to give you full information about YouTube. Which would be good for you? How much can YOU earn? What is Best Online Earning Career in 2019: Blogging vs YouTube? What is Blogging in English? First of all, do we talk about what is blogging? What is Blogging? And how can we earn online from blogs? The blog is a kind of website that is based on a particular topic. In the blogging field, we call it Niche. Blog information & knowledge is created to share. If you have great knowledge on one particular subject, then through blogging you can share it with the world. You keep adding articles regularly to your blog. You want to leave your daily, one-day, one day in a week, as per your convenience; You can publish articles as well. All of you will know about YouTube. There is no need to tell more about what YouTube is like? Well those who do not know, YouTube is a Video Streaming Platform. Anyone here can upload a YouTube channel for free, upload videos to it. The question comes now is YouTube's Paise Kaise Kamaye? So now I'll tell you about Online Earning from YouTube. So you can also understand Blogging vs. YouTube very well. You will notice when watching a video on YouTube in your mobile; Occasionally a promotion (advertisement) comes before the video plays. And YouTubers Money Earn through this same advertisement. The more ads you get in your video, the more money you can earn. Did you know that YouTube's Payee Kaise Kamaye? Now let's talk about Blogging, that is, Blog se Paise Kaise Kamaye? Just as ads come in YouTube videos, blogs also have advertisements. If you go to different websites on the internet, you will see it. Blogging vs YouTube is a way to earn money from both advertisements. You can earn as much money as you would on your YouTube channel or blog. Now we compare little to Blogging vs. YouTube, after which you will be able to understand which Best Online Earning Career can be for you? Earning Comparison: Blogging vs YouTube? If a person comes to blogging or YouTube, then his ultimate goal is money. So firstly we do Comparison Earning in Blogging vs YouTube. What is the more money in both of them? My blog and YouTube channel are both. And according to my experience, you can earn more money in blogging than on YouTube. The first thing that can be made on both platforms is Google AdSense. At least 3,000 to 4000 views will appear in your video to earn $ 1 on YouTube. On the other hand, if there are so many page views in your blog, then you will make 10-12 $ then you will be comfortable Blogging can be a Best Online Earning Career for you from Earning's perspective. Name & Fame: Blogging vs YouTube? How many men can earn, but if you do not get name and fame, then it is not much fun. So now we talk about blogging vs. YouTube, who is Zayed fame? The most special thing, which are the chances to get started early? Because of the presence of JIO in today's time, every person has 4G internet available. In rural areas, the Internet has also been arranged. And in 2019, people like to watch videos on YouTube rather than searching for something on Google. Nobody wants to read an article written on the blog, all want to sit face to face face-to-face video. Because of this, you can be quick to get acquainted with YouTube. There is another reason that people connect well with you in the video. On the other hand, you know the way you write in the blog. Only a few people recognize your face. If you start anything then it starts investing in it. So we talk about investment in Blogging vs. YouTube. If you want to start a blog or want to start a YouTube channel; Which will have to invest more. First of all, talk about blogging investment, in which you have to buy your own Domain Name & Hosting. If you want to start, you must spend at least Rs.2000-Rs.3000 a year. On the other hand, you can create Free Blog with the help of Blogger.com, a Google platform, Blogger.com. But if you want to seriously start Blogging, then I think you should buy your own Domain Name & Hosting. Now comes the question for Investment for YouTube Channel. You must be aware that you do not need to invest anything on YouTube. If you have a smartphone, you can easily upload it to your YouTube Channel by making your video. As your channel grows, you can invest a little bit in the same way. Let's talk about pre-requirement & knowledge If you want to start with Blogging vs. YouTube, what kind of knowledge should you have for that? What is required to Start Blogging vs YouTube? You must have a computer to start blogging. With this, you should also have to run a little bit of the internet on the computer. If you have information about a bit of website, then you can easily earn money from your blog. To start a YouTube channel, you must have no computer or any technical skill. If you know how to run a smartphone, you can become a successful YouTuber. All you have to do is make your video from your smartphone camera, and upload it to your channel. Success Time: Blogging vs YouTube? If you do some work, you also get the result of it. So now the question is how long does it take to get success in Blogging vs. YouTube? One thing I would like to tell you is that YouTube & Blogging does not get immediate results. These are both sources of passive income. It is not that you have worked today and tomorrow your earning will start. Online Earning Career has to be patient. You have to give time in both YouTube & Blogging. According to the way you say, you can get results after 6 months, 1 year or after 2 years accordingly. But, when your blog or channel runs, you will earn as much as you never imagined. So if you are starting any of the blogging vs. YouTube, then do not be too rash. Better, in the beginning, you should do part-time. After you earn a little more money, then you can do it full-time. With this, you will not have a financial problem in the initial days. Best Time to Start: Blogging vs YouTube? You may now have a question that when you start YouTube or Blog? Is there a scheduled time or age for this? Which of the following is better than Blogging vs. YouTube? Which is best in Online Earning in 2019: YouTube or Blogging? So let me tell you there is no appropriate or scheduled time or age to start the YouTube Channel & Blog Start. Whatever your age, you do anything, Student, Working Man, Corporate, Govt. Officer, anybody can start at any time. You can do blogging and YouTube for extra income or as a full-time career too. But, keep in mind that if you adopt a wrong way, then your blog or channel will grow and neither will be earning. So if you want to come to this online earning field, then work right from it, you can achieve success beyond your thinking. Friends, this is just some important things about Blogging vs YouTube in 2019. I hope you find this article which is Best Online Earning Career in 2019? It would have been nice. And by now you must have also decided whether to start a blog or YouTube Channel. I have told you all the following about Blogging vs YouTube. Are you sure you want YouTube? Which is Best Online Earning Option in 2019: Blogging vs YouTube? If you have any questions on any of these topics, please comment below. If you want to read similar and Knowledgeable Articles in Hindi, then you must give your Email ID in our Email Newsletter. Tags # blogging ve youtube # Blogging vs YouTube: Which is Best Online Earning Career in 2019?